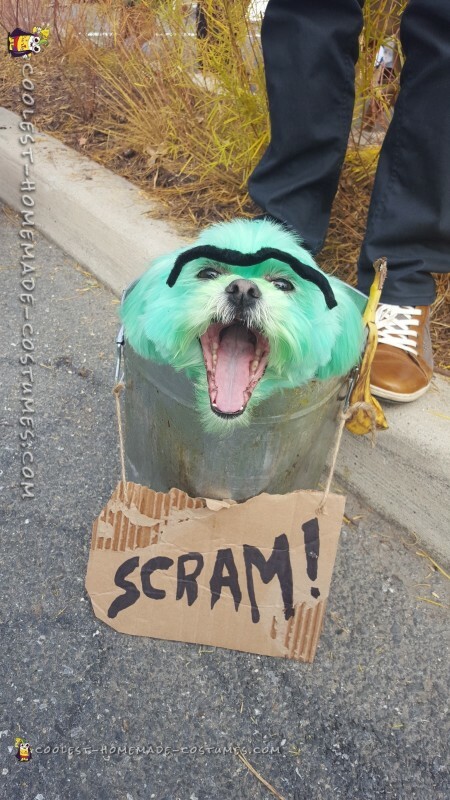 Missy (short for Missy Misdemeanor Elliott) is roaming the streets of DC this Halloween as Oscar the Grouch in a home-made costume this year. I got the idea because Missy is nicknamed miss grouchy because with her under bite she often looks grouchy and is a pretty strong-willed sassy dog! The whole thing costs about $80 at the end of the day. Missy was the life of the party at the events we went to! Everyone (especially children) loved her costume and I couldn’t walk two feet without someone asking to take a photo of her or with her. Missy loved all the extra attention she was getting but didn’t understand why people were showing her so much love. One of the best parts of dressing her as Oscar the Grouch is people’s reactions to seeing a green dog with eyebrows! I got a lot of people doing double-takes from their cars and catching a lot of people laughing when they saw us pass by. Missy went to Barktober Fest which was hosted to support a local doggie shelter and won for most creative costume. She got a box of toys and adores playing with them all! It was challenging carrying her around all day as the can with her in tow got pretty heavy. But it was all worth it in the end (even if my were sore did hurt the next day)! Her home-made costume started with two different shades (mixed together) of doggie-safe hair dye. 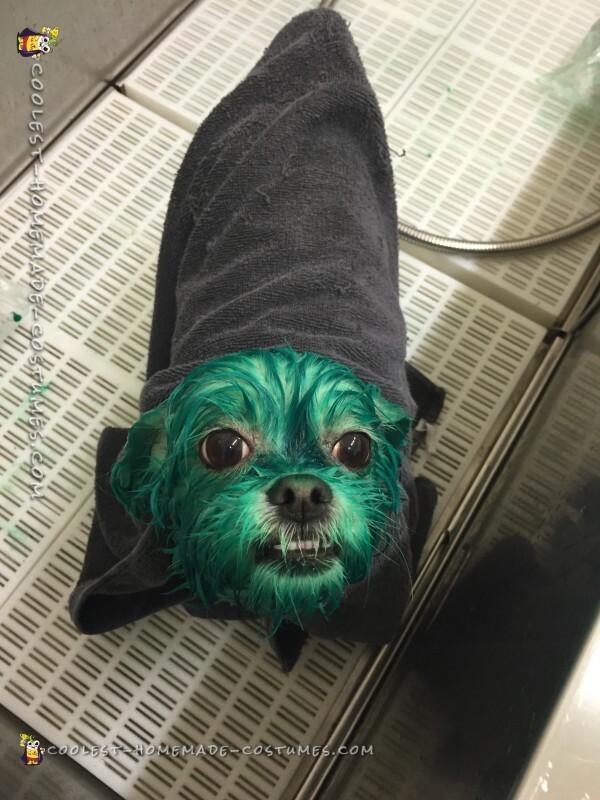 It was difficult finding a shade of green that would come across as green on a white dog. 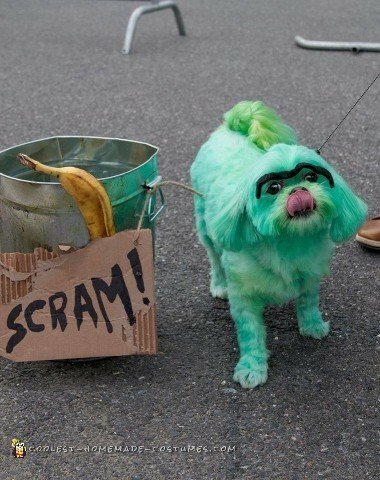 Most doggie hair dyes that are green come result in a neon yellow on a white dog, so finding the right color took a lot of time and multiple practice dyes on small areas of her hair prior to the full dying for the costume. Oscar the Grouch Coming Together! To give her some extra grump, I added some fake eyebrows to her by super-gluing bobby pins to the back of the fake eyebrows and placing the finished product in her hair. At first Missy kept on trying to paw off the eyebrows, but after placing them slightly higher and away from her eyes she left them alone and looked ridiculously funny walking around with them on. To make the Oscar the Grouch trash can (his true home! ), I got a doggie-food storage container that looked like a mini-trash can and distressed it with dirt, grass, and brown spray paint to make it look dirty and old. I even kicked it and dropped it on the ground to make it feel very lived in. I added her grouchy “scram” sign which is an iconic line that Oscar the Grouch says. I added a banana peel to finish the costume off as a piece of trash for her to travel with to the Halloween events we went to. Since I loved her costume so much, I decided to do a photo shoot with Missy. I have a trash room in my apartment complex with big dumpsters. 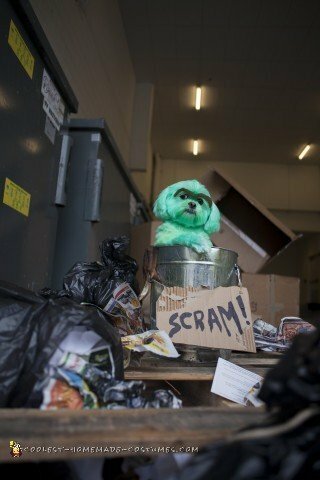 I chose this location for the photo shoot, placing Missy in her costume in front of the dumpsters and I fully staged the rest of the scene around her so it looked like she was in a true Oscar the Grouch environment. I placed her in her costume on top of an old wooden shipping platform and I cut down garbage bags to make mini-bags and stuffed them with hand-crumpled paper to make mini trash bag heaps to place around her. Finally, I placed large empty boxes behind her, laid out old newspaper and other trash around her and her trash can to make the place look like a true dump! 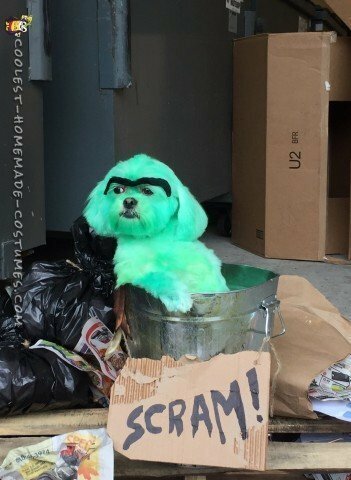 She did wonderfully and loved being Oscar the Grouch!